Country of Origin: Canada. This hairless mutation is said to have been kept by the ancient Aztecs. All colors in all divisions; white lockets and buttons accepted. Appears hairless; texture chamois-like; may be covered with short, fine down; may have puff of hair on tip of tail; whiskers sparse and short. With its almost hairless body, big ears and pixiesh expression, you'll either love or hate it at first sight. However, if you spend a bit of time around a Sphynx, you'll find them companionable, intelligent, and friendly-- all those qualities one looks for in a pet. 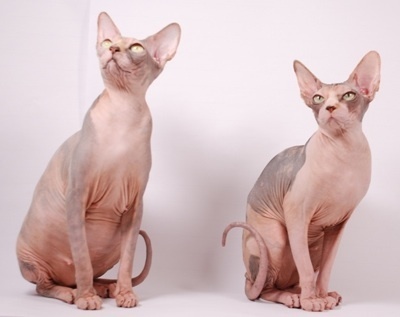 Sphynx are outgoing and love to show off, which makes them always sought out in shows. Sphynxes also require grooming. They must be regularly bathed to remove collections of oily sebaceous secretions on the skin. These secretions are normal; it?s just that Sphynxes don?t have hair to absorb them. Allowed to collect, these oils can cause skin problems.